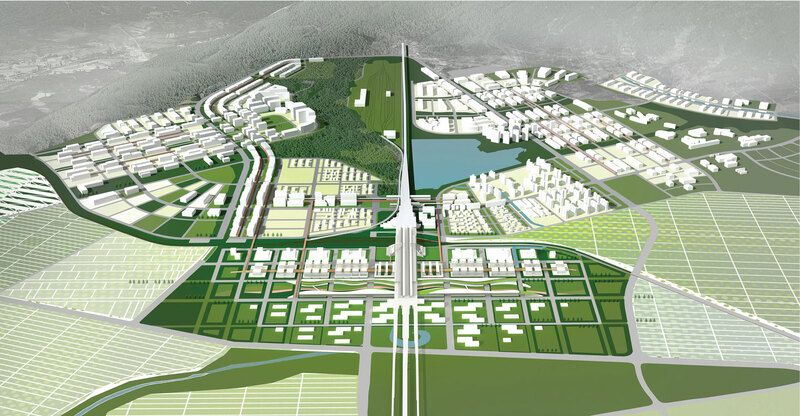 “Dynamic Connections” aspires to have Osong Bio-Valley as a catalyst in reinforcing the regional connectivity and access. It takes advantage of the existing cities and future plans at multiple scales. This plan aspires to connect innovative clusters together that can create synergistic moments for the region. This will help create a connective urbanism that will attract and foster innovation. In turn it will create exciting business opportunities and living environment that will also attract pool of creative class workers and their families. CONNECTING THROUGH GREEN: Densification of strategic core locations and reduced dependency on private motor vehicles frees up spaces typically reserved for roads and parkings for more distributed green infrastructure. Furthermore, the natural elements of water and green are integrated into the MOD as a coherent system that combines mobility with leisure within green. 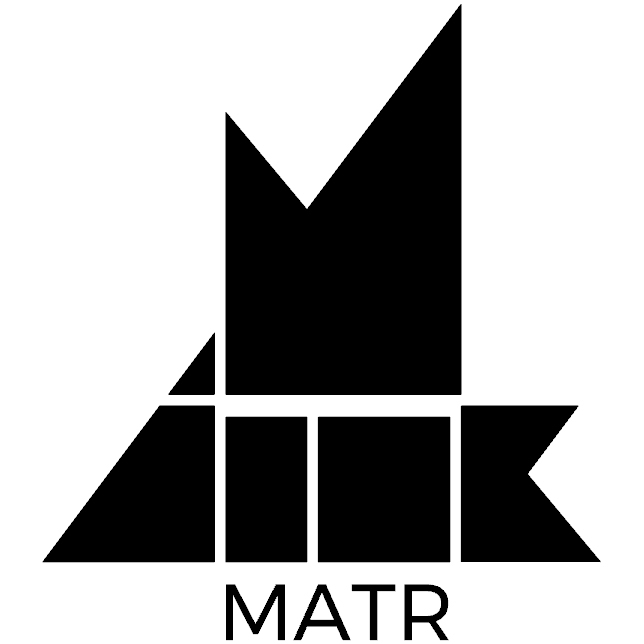 Productive landscape is an extension of this language that attempts to blur the boundary between research, leisure, cutting edge experimentation, and production. CONNECTING THROUGH MOBILITY ON DEMAND(MOD): Innovative mode of mobility, Mobility on Demand (MOD) combined with green infrastructure adds unique connectivity to Osong Bio-Valley that meets the diverse needs of its citizen and visitors. This seamless connec activity is further expanded and integrated to the existing and constructed natural elements such as water and green, and productive fields which are also overlapped with diverse programs of Osong Bio-Valley. 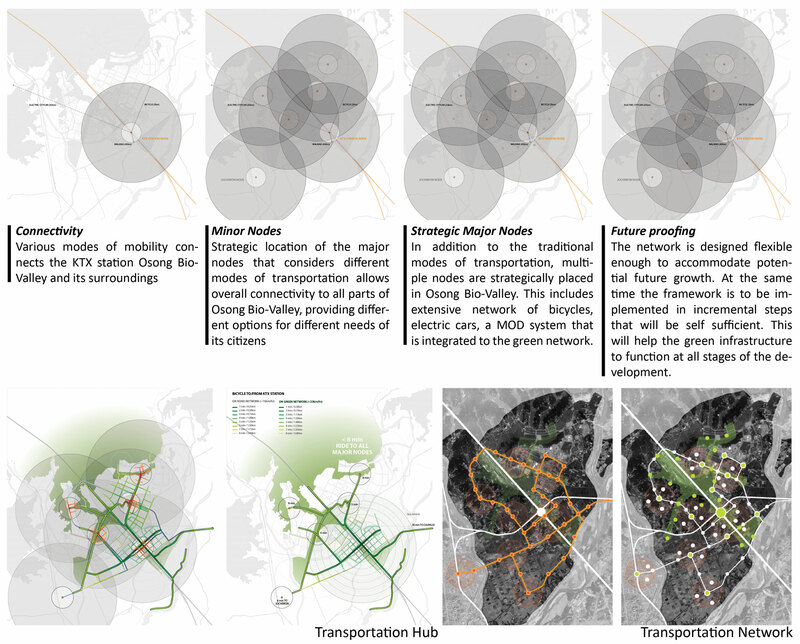 CONNECTING BIO-RESEARCH WITH URBAN SHOWROOMS: Proposed mobility on Demand (MOD) framework further allows a densified pedestrian friendly urbanism at the heart of Osong core and its strategic nodes. Densification further encourages the mix of programs and land use. 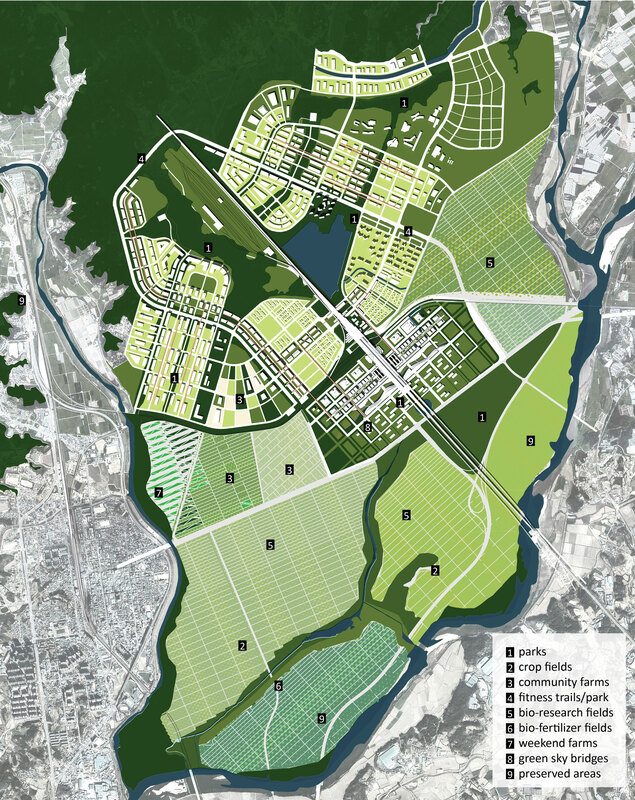 Further, this mixture of program and land use is connected with intertwining clusters of “Urban Showrooms” that is in combinations of Research+Urban Showroom, Education+Urban Showroom, Park+Urban Showroom, Residential+Urban Showroom. The showcasing in the urban showroom combined with research, teaching, living, leisure, work, and production programs incubates dynamic synergies and moments of new innovations. 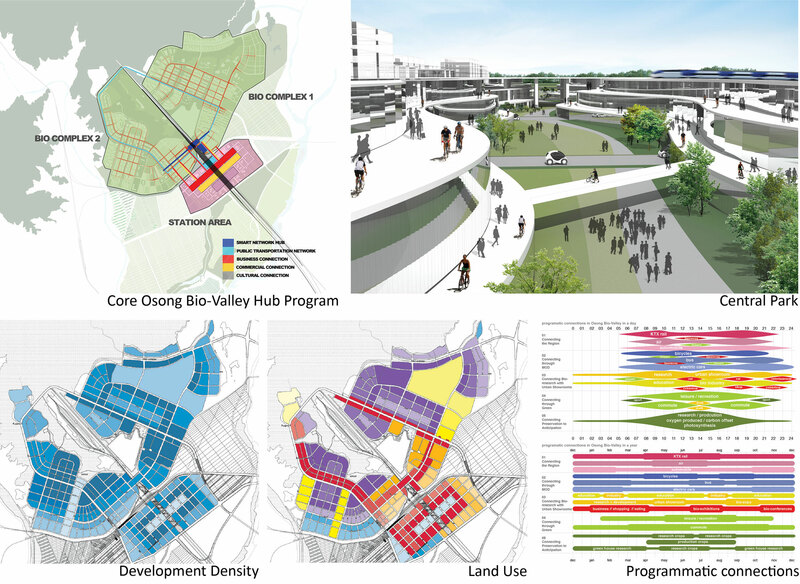 “Urban showroom” and “the experimental productive fields” are exemplars of Osong Bio-Valley’s aspirations as a testing ground and stage for constant experimentation and innovation. CONNECTING PRESERVATION TO ANTICIPATION: Integrated connective green spaces adds value and quality of life to the surrounding environment. The perimeters of Osong Bio-Valley is strategically preserved and connected to the existing body of green, ensuring a robust structure of green will always coexist and balance the potential growth. 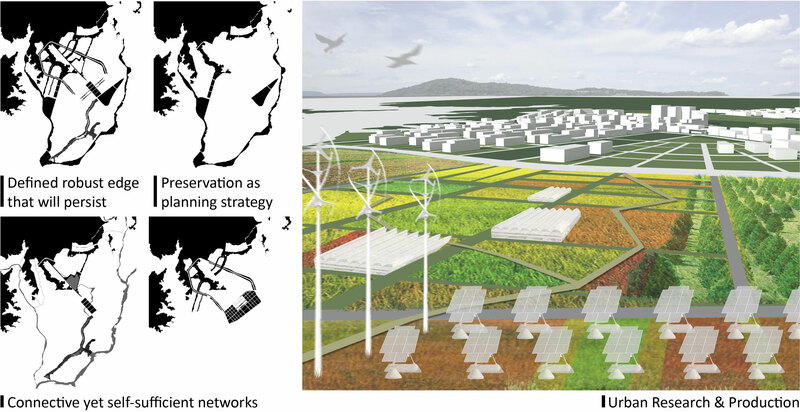 In parallel, the secondary green infrastructure that connects clusters and individual cores are small, flexible and autonomous enough to exist even if Osong Bio-Valley grows very slowly or shrinks in economic fluctuations.